Once again it is our pleasure to announce the August update of the Developer Preview. With this release, we bring you several new features that help building your solutions as extensions. We also include a large number of resolved GitHub issues. See the list of closed bugs here: closed bugs in August. This Developer Preview is available only through the Ready to Go program. Read more at http://aka.ms/readytogo. To get all fixes and features described in this post please make sure you are running an image with a build number 2.0.41872 or newer. This table contains information about page controls on regular pages, as well as on request pages in reports and XMLports. The primary key is “Object Type”, “Object ID”, and “Control ID”, where “Object Type” could have a value of Report, XMLport, or Page. This table reflects information about individual data items in a report, for example: “Indentation Level”, “Related Table ID”, “Request Filter Fields”, etc. With the help of these new tables, it is possible now, for example, to generate the report parameters XML string without actually invoking the report request page. Try this code example. It is now possible to create AL extensions that override the default help link for Business Central and re-direct users pressing the Help button to another website. This also enables translating the help link for Base App objects. Note that this feature is not available for per-tenant extensions and a rule has been implemented for it in the PTE analyzer. See PerTenantExtensionCop Analyzer. In case the user is using one of the supported locales, the supported locale will be inserted in the help link. If the user is not using one of the supported locales, the first locale specified in the ‘supportedLocales’ setting will be considered default and be inserted in the URL. 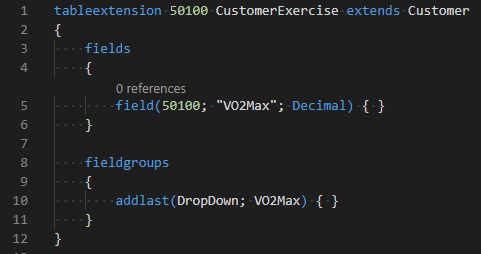 Field groups can now be extended from a table extension with the use of the addlast construct. It allows for adding more fields to the end of a field group. Substitution is performed by setting the value of the NewReportId parameter to the ID of the report that should replace the report with ID ReportId. In the following example, I replace Report 2 with Report 4. If the value of the NewReportId parameter is different from the value of the ReportId parameter and different from -1, it means that the report has already been substituted by another subscriber of this event. The event is called ‘OnAfterSubstituteReport’ to match the pattern followed by other events in the ReportManagement Codeunit, but the subscriber will be invoked before the substitution takes place.